Months of planning, meetings, discussions, arguments… It was all worth it when it came together for a few great days at the Mandalay Bay Convention Center during the hottest time of the year in Las Vegas. And it was hot, especially for INFINIDAT! Team INFINIDAT huddles together before kick-off. Notice how the shoes match the shirts. The calm before the exhibitor floor opens. Sunday night started with a bang. 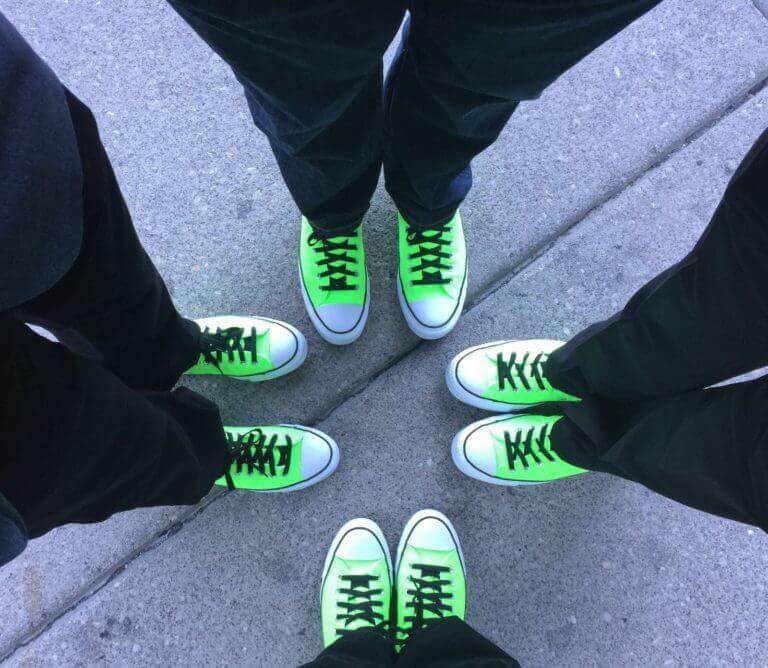 Our booth and our team were decked out in their company colors from head to toe. I got numerous compliments from attendees, and former coworkers on our booth and our custom made Chuck Taylor sneakers. 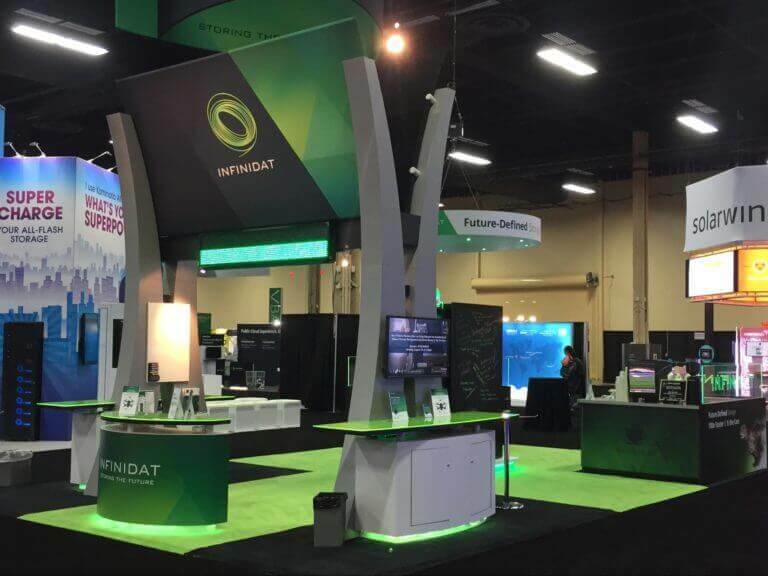 Having been to many previous VMworld events, it was clear to me that INFINIDAT has made significant strides in building our brand and catching the eye of storage buyers. Team INFINIDAT showing off their fancy footwear. A crowded booth is a happy booth. Throughout the week it was just as busy away from the booth. Monday night, Jim Measel with La-Z-Boy presented his session “More Time to Recline: How La-Z-Boy Relaxed the Complexity of VMware Storage Management and Saved Money in the Process,” followed immediately by our customer appreciation dinner at Charlie Palmer Steak in the Four Seasons Hotel. During the dinner, Izhar Sharon, President, INFINIDAT Inc., recognized Jim Measel from La-Z-Boy and Jason Chamiak from Peak 10 + ViaWest for their support and endorsements of INFINIDAT. Be sure to check out Jason’s interview on The Cube with our own Erik Kaulberg. Of course, it wouldn’t be VMworld without Brian Carmody and Randy Arseneau stopping by theCUBE to have a chat with Stu Miniman. Brian and Randy did a great job representing INFINIDAT and made it clear that we’re profitable, growing rapidly, and supporting VMware installations in the majority of our deployed systems. 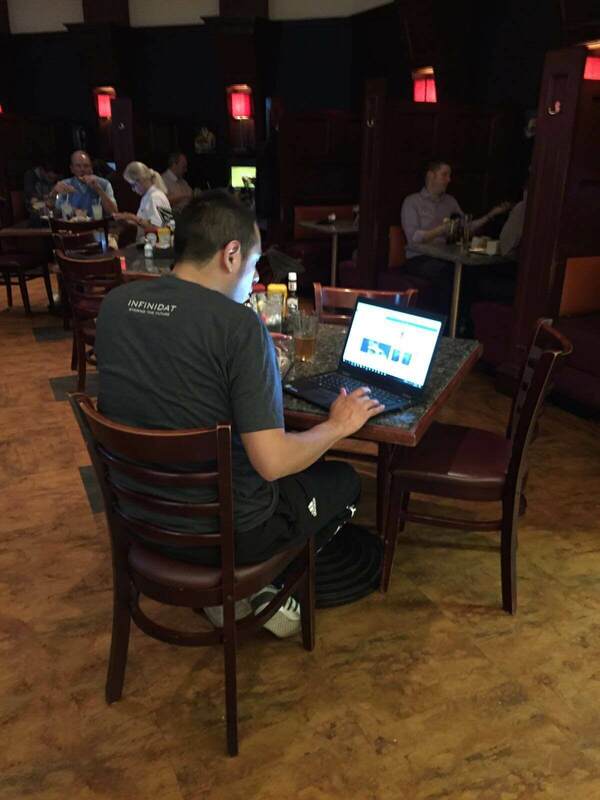 Always great to see our “Faster Than All-Flash” t-shirt “in the wild” after the show. Back at the booth, the conversations covered the entire spectrum of topics and workloads. The demo stations and white boards were constantly in use. Conversations focused on cost reduction and energy savings. There were conversations about applications requiring high performance, low latency and high throughput. Just about every conversation touched on availability and the expectation for rapid recovery. Mixed into all these conversations was the joy of seeing an HTML 5-based GUI built on a RESTful API. Nobody ever wants to see another Java-based UI for as long as they live. Considering all the buzz this year about VSAN and Hyper-converged Infrastructure, there was still a significant number of storage vendors represented at the show, mirrored by the continued interest in storage by the attendees. Without exposing our cards, it was a great show for us and the increase in qualified and prospective leads was remarkable. Team INFINIDAT did an amazing job leading up to the show and throughout the week. Way to go team!! The other was seeing how fast our “graffiti board” filled-up. It started out blank and was practically full of customer quotes and compliments before the end of the second day. 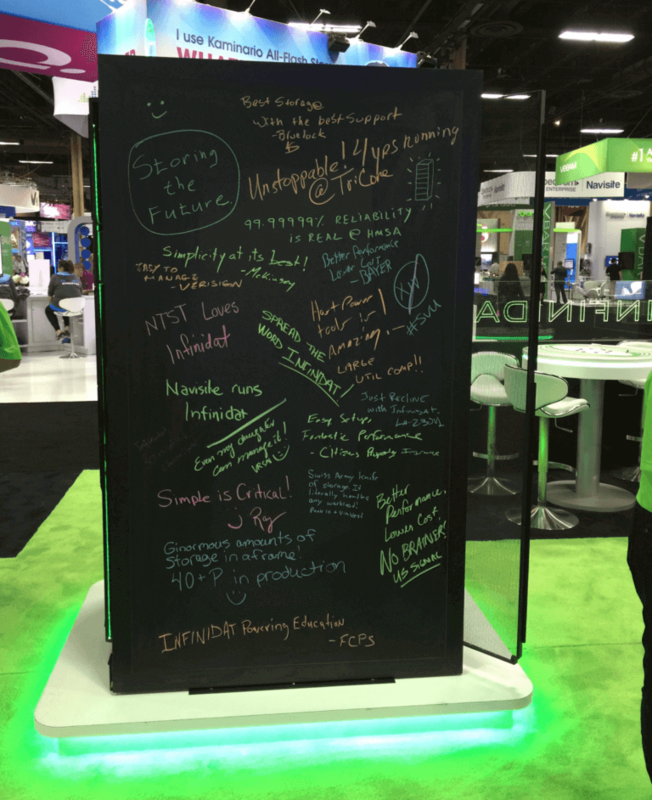 The praise our customers put on the board covers everything we do to deliver an exceptional storage solution, from innovative design to technical execution, user experience, service, support, and more. I guess I’m not alone feeling this way because we’re bringing the board back to our U.S. office in Waltham, MA. We’re going to hang it up in our INFINIDAT Executive Briefing Center and show everyone what our customers think of us. 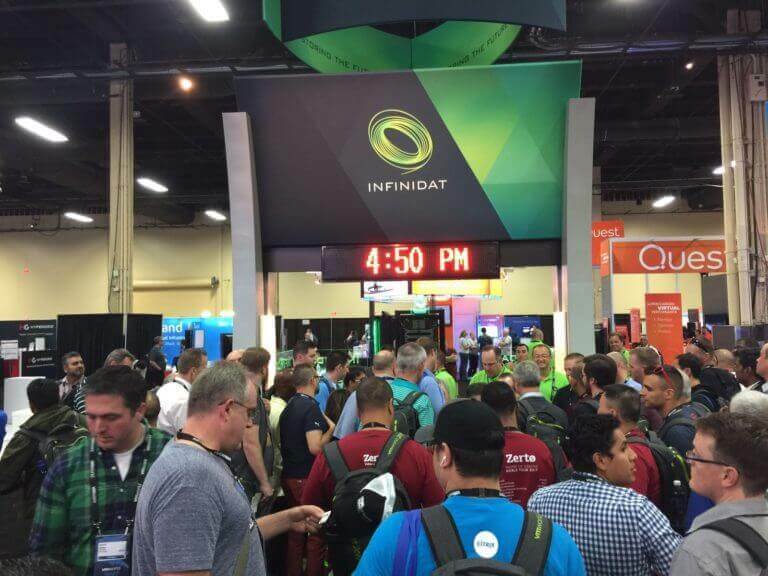 For more photos from VMworld 2017 – Las Vegas check out our INFINIDAT Facebook photo album.